Hand-painted tiles became a popular feature of artistic interiors from the 1860s onwards. Such tiles appear regularly in houses decorated in the Arts and Crafts style, and were used widely by exponents of vernacular architecture such as Richard Norman Shaw (1831-1912). The most common setting for such tiles was in and around the fireplace. 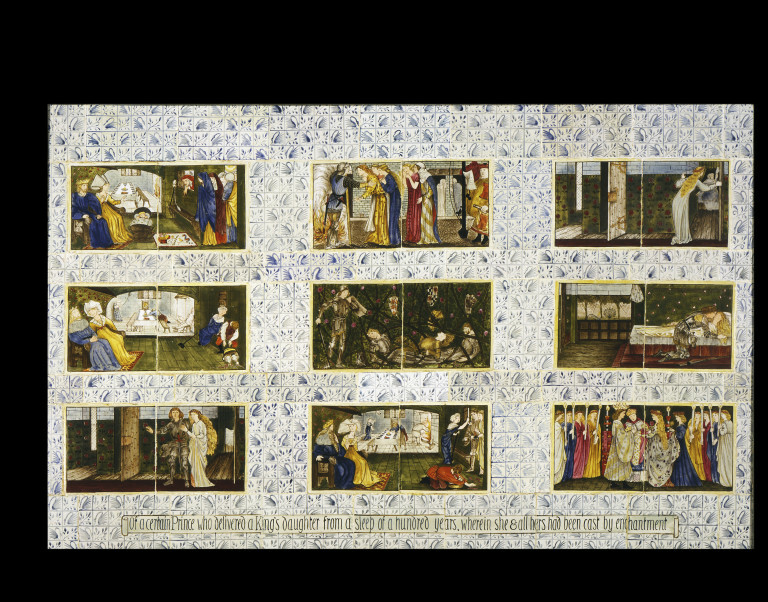 This panel, depicting the story of Sleeping Beauty, is inscribed 'of a certain prince who delivered a King's daughter from a sleep of a hundred years, wherein she and all hers had been cast by enchantment'. 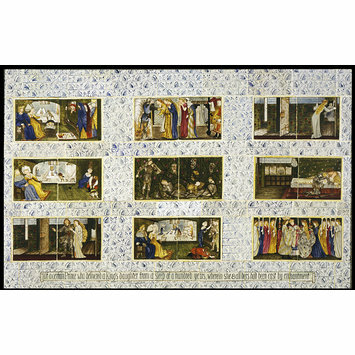 It is one of three narrative panels, produced as overmantels for bedrooms, that were ordered from Morris & Co. in 1862 along with stained glass and other tiles and furnishings, by the painter Myles Birket Foster. The various items were destined for Foster's new house, The Hill, at Witley, Surrey, where the artist was a neighbour of Henry Cole (1808-1882), first Director of the Victoria and Albert Museum. The additional two panels depicted Beauty and the Beast and Cinderella. 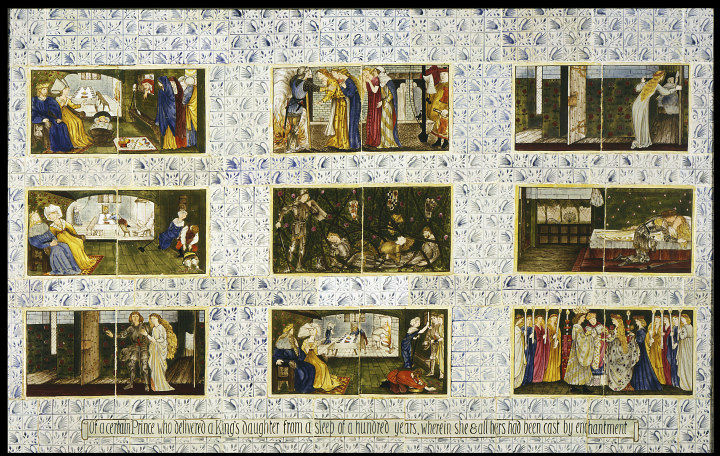 One of three narrative panels, overmantels for bedrooms, ordered, with stained glass and other tiles and furnishings in 1862 by the painter Myles Birkett Foster for his new house, The Hill, at Witley, Surrey. There he was a neighbour to Henry Cole, first Director of the South Kensington Museum. Burne-Jones noted in his passbook of 1864, now in the Fitzwilliam Museum, 'To 10 designs of Sleeping Beauty at the mean and unremunerative price of 30/- each'. This panel was purchased by the Museum following its loan to to the exhibition of Victorian and Edwardian Arts held in the Museum in 1952. Birket Foster left The Hill in 1893 and the lender bought this panel and 'Beauty and the Beast', which is now in the William Morris Gallery, Walthamstow, and stained glass from the last owner of the house. The third panel, 'Cinerella', is now in the Walker Art Gallery, Liverpool. Parry, Linda (ed.). William Morris. London : Philip Wilson / Victoria and Abert Museum, 1996, p189. Barringer, T., Rosenfeld, J. and Smith, A. Pre-Raphaelites: Victorian Avant-Garde. London: Tate Publishing, 2012. Barringer, T., Rosenfeld, J. and Smith, A. Pre-Raphaelites: Victorian Art and Design. London: Tate Publishing, 2012. The two other tile panels in the set are signed by Lucy Faulkner so it seems likely that this one is also by her. The Swan pattern border tile was almost certainly designed by William Morris as Aymer Vallance has attributed it to him as did May Morris in the catalogue of the 1934 William Morris Centenary Exhibition held at the Victoria and Albert Museum (No.176).